Walk starts at 10:30. Please be dressed by 9:30. 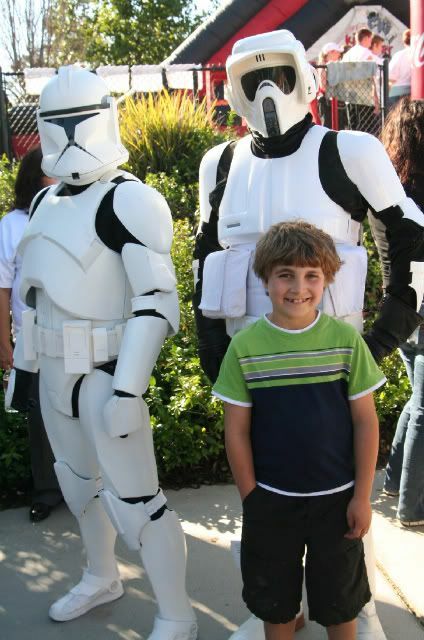 Endor Base has been invited back to participate in Sacramento Walk Now for Autism Speaks. This will be a joint event with the Central California Garrison and we plan to form a walking team with them again. The route will be a little different this year (crossing the Tower Bridge and turning around at the Capitol), but shouldn't be more than 3 miles. If you're unable to walk that far in your costume, you can mingle around the registration area or you may be placed at the end of the walk route. This is a NO WEAPONS event, including lightsabers. For those of you who are interested in participating in this event, please go to the Walk Now for Autism Speaks website and register yourself as a team member. After you've done this, you may collect donations from friends, family, and co-workers if you'd like. 2) Click on the "Donate" tab and select "Support a Walker". 3) Enter the name Eugene Shim and hit enter. The donation link for the Central California Garrison/Endor Base team will appear below. Follow this link to make the donation. The donation goal set for our team is $150. The donation link is under my name since I registered the team, but it does tie into our walking team. Thanks Eugene for setting up our team. I'm pretty sure I should be able to make this one. I've put out this info on my facebook profile in the form of a posted link. Feel free to copy the text of my posting if you'd like to seek donations this way. On Sunday October 10th, my friends and I will be participating in the Sacramento Walk Now for Autism Speaks event at Raley Field. This will be our 3rd year walking this event to raise funds for autism research. You'll see members of team "Central California Garrison/Endor Base" walking this event as costumed characters from the STAR WARS saga. We encourage you to join us for this worthy cause. If you're unable to attend but would like to contribute, you may make a tax-deductible donation under our team. To do so, please follow the link below. I plan to wear my Ewok Village Leia costume unless we have an extreme change in weather! Once again Endor Base and the Central California Garrison formed a team for the Sacramento Walk Now for Autism Speaks. This year the team doubled in size from 3 to 6! The other thing that doubled was the length of the walk from one mile to 2.1 miles. Endor Base members in attendance were: Pam as a jedi, Scott as a biker scout, Eugene as a clone and me as Leia. CCG members Refugio and Adam were dressed as a biker scout and TIE pilot. We all arrived at Raley Field at 9:00 to get dressed and be ready to meet the crowds at 9:30. We posed for pictures with a lot of children for an hour before the walk started. The men in armor were quite popular with all the boys, but Pam and I also got picture requests from some of the girls. Along with the new walk length was a new route taking us over the Tower Bridge and straight to the capitol building where we turned around and headed back. We started out in the middle of the pack, but because we were asked for so many pictures along the way, we ended up being one of the last groups to return from the walk. Over 8,000 people attended the event and $223,000 were raised for autism research, advocacy and awareness. In addition to collecting donations, our costumed volunteers added an element of fun to the event. One parent said to us, "Thank you for coming out. You really made my son's day!" Great report, Tina. I was really glad that we were able to form our largest walking team yet. I'm glad the event turned out so well! Congrats to all!